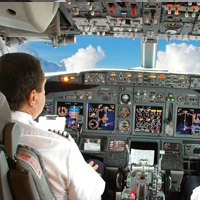 Take the control of a Boeing 737 simulator! After a short 20 minutes theoretical training on how the airplane flight simulator works and some basics aviation principles, take the captain seat of a Boeing 737 flight simulator for 60 minutes. A professional flight instructor will assist you as needed. Choose the location of your flight among the 24,000 possibles destinations ! A great experience and a memorable gift . Minimum age of 13 years old.